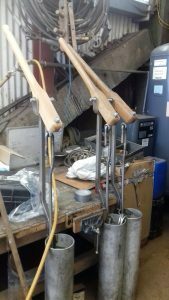 New old-style pumps in manufacture by Heritage Marine for our new Thames sailing barge Blue Mermaid. These barges had one pump centrally forward and one each side aft to pump out the hold. Now they must be able to reach each compartment so they are being fitted with shared valve gear. Thus one aft pump will reach hold and galley, while the other reaches hold and cabin. The forward pump will reach hold and forecastle. You can also see the planking being fitted to her aft cabin top here, new sheaves and more recently foghorn.